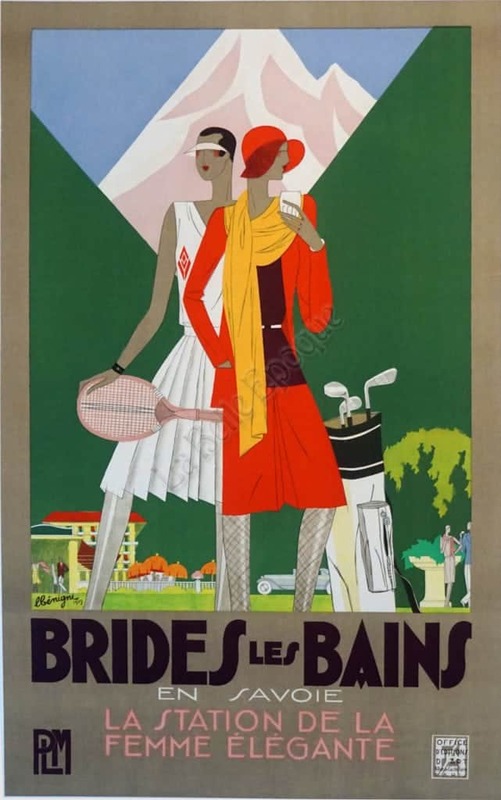 This is a French Art Deco period travel poster commissioned by PLM (Paris-Lyon-Mediterranee) railway for Brides-Les-Bains in France and was created by Leon Benigni in 1929. Brides-les-Bains is a spa town located in the Rho^ne-Alpes region of France. This stunning poster features geometric mountains in the background which the Benigni uses to frame the two chic women standing in the foreground. One woman is dressed in an outfit for tennis, including the racket, and the other is elegantly dressed in red, wearing a wide-brimmed hat, standing next to a set of golf clubs. Behind them is a glimpse of town, with a building, car, and sun umbrellas. This poster exemplifies the work of the influential posterist Leon Benigni, one of the most recognized Art Deco period French poster artists.